Life With a Whisk: Dreary skies and coffee cake. 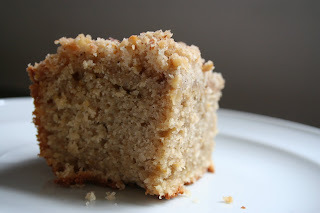 Dreary skies and coffee cake. I love a good coffee cake. It's such a simple baked good, but when confronted with a slice, I know few people that would refuse it -- especially with a cup of coffee. It doesn't matter whats mixed into the batter. Exotic fruits, fragrant spices, a chocolate swirl -- as long as it has some buttery streusel on top, I'm all over it. 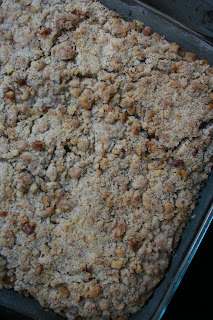 This week's Tuesday's With Dorie choice of Cardamom Crumb Cake by Jill of Jill's Blog was one that I especially couldn't pass up. It wasn't until the last few years that I really tasted what cardamom was like, and I've loved it ever since. Nearly anytime a recipe calls for cinnamon, I always try to add a tiny bit of cardamom and freshly grated nutmeg. It's such a distinct taste, and relatively accessible in my opinion, but it appears on menus and in baked goods so rarely! I didn't have orange on hand so I ended up using lemon, but I think it was still appropriate. Despite the butter content of this cake, the citrus made it so light. And combined with the sugary streusel, I didn't quite want to have just one piece. I'm glad that you enjoyed this! I like your idea of adding some cardamom to recipes that call for cinnamon. Thanks for baking with me this week!